Welcome to my little bit of blogland. 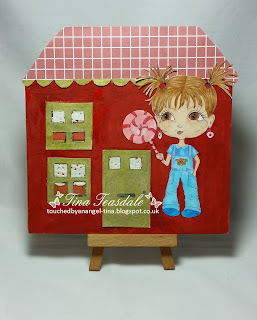 The theme this time is Doll House and this time it is a month long challenge. Here is my little creation and I hope that you like it. I created a house shape by cutting the fold corners fro, a 5x5 card blank and created a roof by popping on some check paper from my stash. The door and windows are simply made by coloring white card with gold promarker and cutting out the windows. The image is the fantastic lollipop girl available in the Julia Spiri store and she is colored with copics. Pop along and join in the fun over at the challenge blog to be in with a chance of winning the fab prize on offer. Gorgeous card, love the cute dolls house and sweet image.